(October 23, 2018 – Carrollton, TX) There are a variety of nicknames that have been shared regarding Mother Nature in the past two weeks that are likely too explicit to write in this story. The long wait that finally saw the clouds part and the fields dry around the Dallas metroplex enough to allow for baseball saw the Spirits (18+) bats come alive Tuesday night as they blasted the Spartans by a score of 14 to 1. 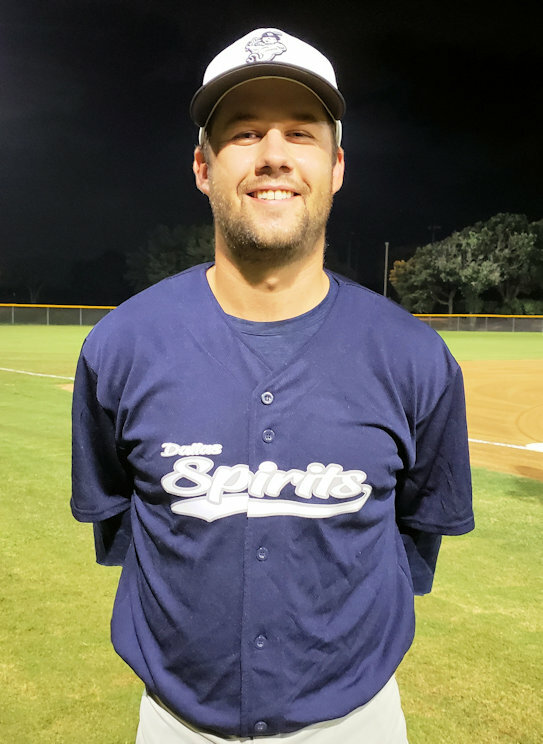 Starter and interim team manager, Duane Aponte went the distance for the Spirits delivering 6 innings of work allowing just 1 run on 7 hits while walking 2 and striking out 1. Aponte also added a pair of runs batted in, a run scored with a hit on the evening and a sacrifice fly to help carry his squad to another NTABL Fall Trinity Division victory. Mike Werner led the box score with a 3-for-4 performance that included a triple and a run scored. 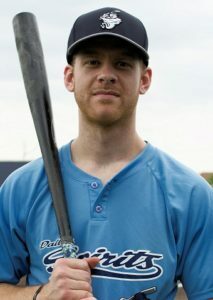 Sam Tanner was also an offensive force, adding a pair of hits and a run scored plus 3 runs batted in. Teddy Croft added a double and 3 runs batted in and as a squad, the team finished with 14 runs, 11 hits, and drew 6 free passes to first. After a slow start for both teams, the Spirits put up a six pack of runs in the bottom half of the second when Werner led the inning off with a single and was then forced at second when Holden Novak reached on a fielder’s choice. With one on and one down, Colton Bucker drew a walk and Novak would later swipe third base. Kyle Redinger went down on swings and it appeared the Spirits may strand opportunity, however the team rallied with two outs beginning with Novak taking home on an error by the Spartans catcher. Aponte would then single to score Bucker, who advanced on the previous play and Adam Bartczak followed by reaching on a Spartans fielding error. A single by Cliff Brade loaded the bases and a follow up single by Tanner scored both Aponte and Bartczak and the Spirits had a 4 to 0 lead. Croft then doubled to score both Brade and Tanner and the lead was pushed to 6 to 0. The Spirits made it 8 to 0 in the third after Buckner led the inning off with a single and later stole second. Redinger drew a walk and stole second after Buckner had advanced on a throwing error by the Spartans catcher. Aponte’s sacrifice fly ball was good enough to score Buckner and a single by Bartczak would later score Redinger to give the ghosts the snowman on the scoreboard. The Spartans scored their lone run in the fourth after Brandon King doubled to lead off the inning and Aponte walked Charlie Griffin. Fernando Moore singled to load the bases for the Spartans, but Horace Borders II grounded into a fielder’s choice that forced King at the dish. Griffin would later score on an error by Croft, but Aponte was able to retire both Nathan Hernandez and Alex Casimiro to end the inning. The Spirits added 5 more runs in the bottom half of the inning after Werner tripled to lead off and scored when Novak reached on an error. Buckner went down on swings, but Redinger followed up with a base-on-balls. Aponte flew out to make it two down in the inning, but that didn’t break the offensive rhythm as Bartczak reached on a walk and both Novak and Redinger would later score after Brade reached on another Spartans fielding error. Tanner reached on yet another error that allowed Bartczak to score, and Croft made it a hat trick after reaching on a third straight error that allowed Brade to score. The fourteenth and final run came after both Novak and Buckner drew walks in the fifth and Redinger followed up with an RBI single to score Novak. The defense made quick work of the Spartans in the sixth after Hamm led the inning off with a single and the infield spun a double-play on Wesley Hayes and Hamm. Tanner Gibson flew out to end the game due to time constraints. The win moves the team to the fifth spot for the Trinity standings with just a few games left as teams anxiously await rescheduling due to the two weeks of rain that have essentially ruined Fall baseball in Dallas. The Spirits are slated to play this Sunday afternoon at 5:30PM as they visit the Oak Cliff Pelicans at First Baptist Academy. You can click here for schedule details, driving directions, or to download the iScore Central app to watch and listen to the game live, online.